Below is an overview of STOL and Utility airframes that have been Corvair powered or are in excellent candidates for the engine, that we have already looked at closely. Included with many of the airframes listed are links to stories about them. This group of planes are all high-wing cabin monoplanes. There is a good selection of designs for builders to choose from. There are others that would work as well, for example Morgan William’s lite star http://www.customflightltd.com/aircraft-kits-1.html Has flown on Corvair power, but I have just written an overview of the planes most people ask about. If you have a plane in mind that you don’t see here, just send me an email. This is a good match for the Corvair. There have been a number of them flown in the last four years, and many more are in the works. The 750 has flown on 2700, 2850 and 3000 cc Corvairs. We make every part to install the engine on a 750 airframe and have a Zenith specific install manual. The last link below has a very complete over view. Above, the flying 2850cc Zenith 750 built by Gary Burdett of Illinois. It has our full complement of Zenith installation components and one of our production engines. We flew our 701/2700cc Corvair test bed aircraft in 2007. The combination works, and a few have been built, but the 750 has stolen a lot of the potential popularity. If anyone is looking at both airframes, they should pick the 750, because it has matched hole tooling and is far easier to build. It is a better match to a Corvair. Economically, a Corvair powered 750 will still cost a lot less than a 912 powered 701. The link below the photo has a very detailed look at the combo. The plane below was made of all our off the shelf engine components, and the entire plane and engine was built in our Edgewater hangar. Is a 20 year old Canadian design with automatic leading edge slats. It has a metal wing and a steel tube fuselage. We finished and flew the first Corvair powered on in 2007. the story is in the link below the photo. The engine has all of our conversion components. Every part ahead of the firewall was built in our hangar in Edgewater. Below, our Wagabond, N707SV, flying over the Intercostal Waterway near the Atlantic Ocean in 2005. The airframe is based on a highly modified 1964 Piper PA-22-108 (Colt). The plane was built as a group project by “The Hangar Gang” between 2003 and 2005. It has been flown by a number of well-known Corvair pilots who all found it to be a well behaved work horse. In person, the plane is very large for an LSA legal homebuilt. The airframe is the size of a Tripacer, and sitting on the ground the spinner is as tall as I am, yet a direct drive 100 HP Corvair easily flys this plane, including a test flight where the plane climbed out with a payload greater than its own empty weight. Originally flown to shows by David Vargesko, today the plane has been modified and refined by Grace and myself, re-engined with a 120 HP 3000 cc Corvair, and functions as our personal Corvair powered plane. It is a 5 gallon per hour, 100 MPH plane with a very large baggage compartment. With Grace, the dog, myself and 36 gallons of fuel loaded, it can still carry 275 pounds of equipment and stay in CG. Below is a link to film of Jeff Moore’s Merlin flying on floats in Newfoundland. The airframe has a strong following in Canada. This particular plane was originally powered with a Rotax. Jeff’s plane uses most of our Gold engine parts and one of our stainless U-2 exhaust systems. The engine is a 2700 cc motor with a Weseman 5th Bearing. Jeff and the Merlin with Corvair installed. The plane was originally Designed by Steve Wittman in 1937. It was vastly ahead of its time. Later modified to have full span movable leading edges. Grace and I worked on the Buttercup pictured below with the intention of finishing it for ourselves before we had a change in direction. Our standard intake and U-2 exhaust fits the plane, along with all of our gold engine components. Above, the motor mount for our Wittman Buttercup. It is an intensely complicated mount because it incorporates Wittman’s tapered rod landing gear sockets (the modern Buttercup actually uses RV-6 landing gear legs). Earl Luce, the plans provider gave me all the operational data and weight and balance info for his O-200 powered plane, which I mathematically worked out to the Corvair installation. The Mount resembles the O-300 mount for a Tailwind. After completely welding it, I took it to our local powder coater, and had it done in U.S. Navy gray. It was the 40th different Corvair Motor Mount Design that I have built. Today two builders are closing in on finishing the Corvair Buttercup combination, but none have flown yet. The plane above is being finished in Wisconsin. The Murphy rebel is an all sheet metal Canadian design almost 25 years old. It is not currently in production. It is a complicated plane to build compared to other all metal designs like a Zenith. Below is a link to a story I wrote about how people who know nothing often say the Corvair will not work on utility planes like the rebel, in spite of all the evidence on this page that speaks to the contrary. The commentary and data in the story is worth reading for anyone looking at a Corvair engine for their homebuilt. I consider this plane to be the best flying plane in it’s category. I worked directly with the designer Bob Barrows to develop a Corvair motor mount for it. I flew Bob’s prototype, and it has excellent handling qualities. The design uses or standard intake manifold, and a stainless exhaust common to our Zenith installation. The only Kitfox model that has flown with a Corvair was the model 5. The builder had a number of issues, related to using a poor choice in carbs. 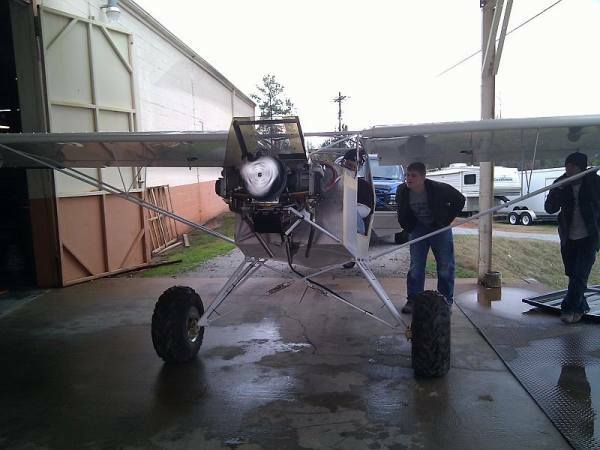 Below is a link to a Kitfox 4 mount we made in my shop. The engine is slightly too big for the model 4, but it is a good match for the series 5 and up. The factory likes to promote engines they sell cowls for and have a dealership on. 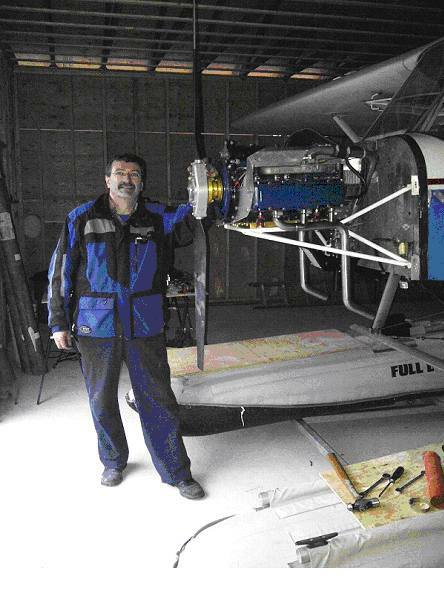 Kitfox has had three different owners in the last 25 years. The current ones did not sell the bulk of the unfinished model 5’s which are available second hand from internet sources like barnstormers.com for less than 50% of their original sale price. Combine one of these with a Basic Corvair, and it is possible to build a good plane for less than $18K, airframe and engine. Ray Stits, the man behind the fabric covering system designed a series of very successful planes in the late 1950s. 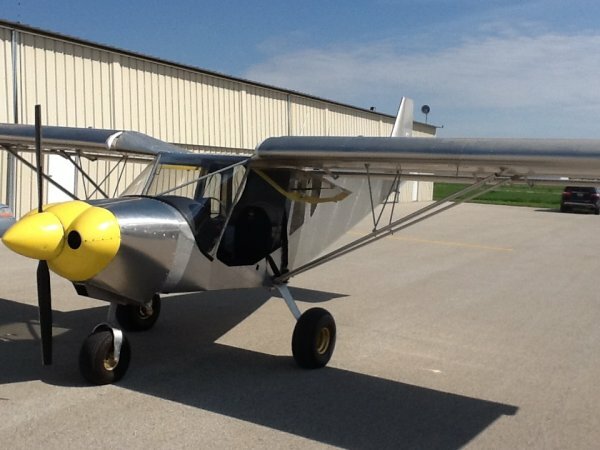 The Skycoupe was once one of the most popular 2 seat planes in the EAA. Several hundred were built, and their was even a FAR-23 type certified model. It is a stout plane, but it is small inside by modern standards. We put about 200 hours of flight testing on ours, it is a natural match for the Corvair. Below the photo is a link to pictures of turbocharging the design. Above, the Skycoupe on the ramp in front of our Edgewater hangar in 2007. We made every component ahead of the firewall on this plane. Both of these designs have flown on Corvair power. I built the motor mount for them, and most of our off the shelf components fit the installation. The plane has strong appeal for builders who like wood, but it is not as rugged as steel tube designs or all aluminum ones. The first plane ever to fly with a Corvair was a J-3 in 1960. The Corvair would make a very good power plant for any of the J-3, J-5, PA-12 family of airframes. Below is a photo of the first Corvair/highlander to fly. It was not a success because the builder insisted on using a left over cowl from a Jabaru 3300, and the Bing Carb from the same engine. He also ran the engine was a display without any form of cooling for a long period on the ground prior to the first flight. With the wrong cowl and carb, it should come as no surprise that the plane overheated. From the pictures above, we have plenty of evidence that the Corvair can easily power larger heaver and slower planes than the Highlander when it is equipped with the correct cowl and carb. .
Is an older design that is somewhat similar to a champ. The plane has many fans, but it would not be my first choice in a utility plane. It is called a STOL plane, and it is by Lancair standards by not by Zenith standards. The plane pictured below was powered by a 2700 Corvair with a Rinker Gearbox, a design from the 1970’s. The gear box failed in 28 hours because the machinist employed by the builder decided to omit a keyway critical to the design. The combination will work much better as a direct drive plane. Below is a one of a kind plane, built from some BC-12D parts. Today the FAA has cracked down on this practice, but with a friendly DAR this could still be made. The plane below is powered by a 2700 and has clipped wings. It topped out at 130mph. This very slick aircraft is the handiwork of Gary Loucks of New York. Any experience with the use of a Corvair engine on an all wood high wing such as the Fisher Dakota Hawk or the LSA variant of the Falconar Maranda? A nice review of options. I too would be interested in an answer to the above gentlemens questions about the Dakota Hawk or Maranda.